Did Giani in 1945 from Panjab University, Lahore. Literature, history, folklore and divinity. > He started and edited Parkash, a daily Punjabi newspaper from Patiala in 1947. It was the premier Punjabi daily newspaper of PEPSU, and continued as a daily till 1961. It was subsequently published as a weekly till 1978. > Started and edited a monthly literary magazine, Jiwan Sandesh in 1953. > Started and edited the monthly Singh Sabha Patrika, which was published from Amritsar, Delhi and Chandigarh. This magazine made singular contribution to studies of Sikh history and divinity from 1973-1988. > Edited 50 books, with introductory essays, for the SGPC in connection with tercentenary celebrations of the Khalsa. > Offered a job as research scholar by Shiromani Gurdwara Prabandhak Committee in 1946, but the offer was politely declined. > Appointed Secretary of Dharam Arth Board, PEPSU, 1948. > Founder , Sri Guru Granth Vidya Kendra, Andheria Mor, Mehrauli, Delhi. > President, Kendri Singh Sabha Academy, Chandigarh. 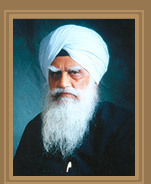 > Member, Dharam Prachar Committee, SGPC, Amritsar. > Honoured by Gurdwara Woolwich, UK, 1991. > Punjabi Sahit Shiromani Puraskar, Languages Department, Punjab, 2006. > Godrej No. 1 Doordarshan Panj Pani Sanman 2005 for contribution to the Punjabi heritage and culture by Doordarshan Kendra, Jalandhar.